We will show you how to draw a realistic apple along with the tutorial on how to shade it in a step by step and easy video tutorial.Apples are good and healthy fruits to eat but have you ever considered making a proper drawing of a red and ripe apple or a contracted sour small apple apart from your school drawings in which we all were bound to draw somewhat not acceptable to real world drawings to get good grades in our quizzes and exams. Well, now you all have an opportunity to draw some professional kind of what you have drawn in your kindergarten. it’s now a time for some real things and we hope that our students can get a good amount of simplest tutorials to digest. As this website focuses on making tutorials for school kids, so for beginners, it’s a piece of cake, just take it and swallow it. You have to pick up your pencil and start sketching around on your paper sheet. First, watch the video tutorial, then give it a try on watching the informational second time. If you have watched previous video tutorials , then this one may be the easiest of all for you. I hope this video tutorial won’t take enough of your time to pick the things up. Watch the video below. This video was made for you in a straightforward way and its hardness level was set by artist to beginners level. Any school guy can master it on just couple of attempts with less time to spare. 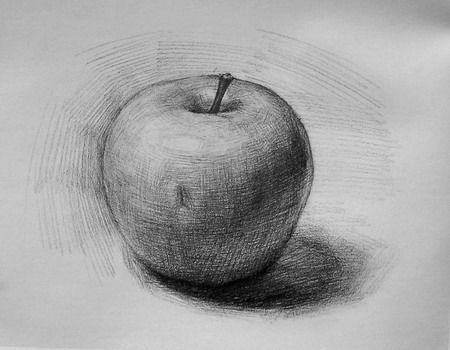 After watching the video it will be very easy to draw an apple for you. Share this simple video to your friends and watch our next special video in the same simple manner.Visit this site daily as dozens of uploads are made for you daily.